The D&RGW's Third division is represented on this double deck 18' x 43' Sn3 layout. The line between Gunnison and Ridgway, Colorado is included with a freelance connection of the San Migual and Southern, on the Ridgway branch, and a connection with the Timber Creek Railway near Gunnison. These connections were added to generate a bit more operating fun on a line that seen very little traffic in the 50's, the era modeled. Operation on the D&RGW is basically done in a chronological order using car cards. Include is a daily passenger run, a daily freight, a coal run, and a stock extra. Several locals are included, as well. 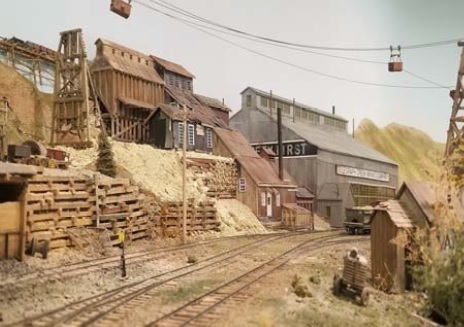 The Timber Creek operation incorporates a run to the tipple for live loads of ore and then a run to the smelter for dumping in the rotory dumper. The coal tipple along the D&RGW line is also a live load operation. Operation on this railroad is brand new, and still undergoing refinements. For more detailed information on Doug’s DRGW 3rd Division click here.